So here we have it: the beast. The big one. The book so huge, it spawned a year-long project. But was it worth it, I hear you cry? Well, yes. But not for the reasons you might expect. When I picked up the book, I was expecting a great, grand narrative unfolding the life and times of one of England’s most memorable, irrational and charismatic kings. I was a bit daunted, truth be told, remembering the hefty history tomes in my school library. (I gave up history at the age of 14 and still to this day can be plunged into a maelstrom of ignorance and guesswork by such names as ‘William of Orange’, ‘Pitt the Younger’ and ‘Edward the Confessor’). 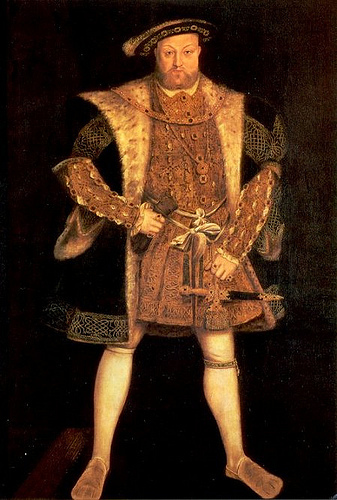 In fact, just about the only period of history I know anything about is the Tudor period. Most of my knowledge of this is gleaned from a project I embarked on at the age of 12 trying to work out if Anne Boleyn really had ruled for 1,000 days, not realising that I could find out the answer from pretty much any textbook. Nevertheless, even with my expert grasp of all things Tudor, I found the prospect of wading through Hilary Mantel’s 650-page doorstop a little off-putting. It felt like getting an invitation to a back-to-back screening of David Starkey’s programmes: fascinating and terribly good for you, but more than a little bit like hard work. As it turned out, I needn’t have worried. For, although the book makes no bones about taking on History (with a capital ‘huh’), the positioning of the camera on the shoulder of urchin-turned-trusted-adviser Thomas Cromwell keeps it firmly rooted in the personal, private and everyday details that bring characters alive. Tics are recorded. Nicknames flit from mouth to mouth. And the million little mannerisms and oddities that make up a person are lovingly scrutinised and set forth. Seeing Anne Boleyn through her archness of manner, her casual cruelty to her sister and the snivelling little serving wench who frequents her chambers, and Henry through his flashes of fear, kindness, and the ornate ring he fumbles off his finger to send to his wife on news of the birth of his son, brings home the humanity and fragility of the people involved. We might be used to thinking of them as finished characters on history’s stage, but for the notaries of the House of Tudor life must have been as muddling and shambling, as taken up with petty annoyances and frustrations, as it is for anybody. The effect of watching them at close quarters is like shuffling along a great tapestry with a magnifying glass, marvelling at the deftly woven threads. Another surprising thing was the circular feel of the narrative. Although the story is ostensibly chronological, seeing it through Cromwell’s eyes gives the novel a strangely circular feel, as we move with him around the city’s seats of power, in ever tighter spirals. It is like watching a spider working its way round and round a web, adding layer after layer of meaning to the structure. That’s not to say that the book is perfect. In one or two of my less charitable moments, reading with my head craned under someone’s armpit on a rush-hour tube, I wished that the editor could have been more ruthless, particularly as the interminable business of settling Henry’s divorce and marriage to Anne drags on. The book would not have suffered for having one fewer simmering discussion, or missing a significant glance or two. Hang the historical accuracy. But, taken against the achievement as a whole, this feels like a minor point. Overall, the book surprises with its intimacy and subtlety. If the grand, male narrative occasionally sinks beneath the sea of details. It emerges all the brighter for it.